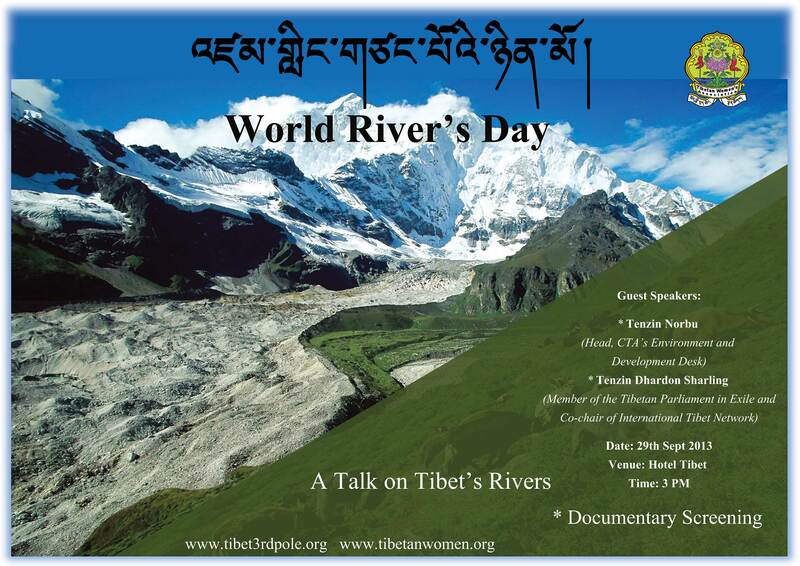 s Day’, Women’s Environment and Development Desk (WEDD) of the Central Tibetan Women’s Association organized a public seminar on Tibet’s River and its importance for Asia’s sustainability. This event was aimed to inform and spread awareness about the importance of the rivers in Tibet and the adverse effects of climate change on the roof of the world. Not many people are aware of this critical issue and hence we felt the need of a public awareness event within our own community. Yet many foreign friends also turned up for the event. Millions of people around the world participated in the ninth annual World Rivers Day on Sunday, and we are so glad to be a part of this huge campaign. “I have traveled on several rivers in and around Tibet and your event is very timely and important. Rivers are integral to all life and yet many waterways continue to be impacted by inappropriate practices and inadequate protection,” a message from Mark Angelo, Rivers Day Chair and Founder and Chair Emeritus of the Rivers Institute at the British Columbia Institute of Technology (BCIT). Our first speaker Tenzin Norbu (Mr.), (Head of the Environment and Development office of CTA) spoke on ‘Tibet’s Rivers and their significance for Asia’s sustainability’. He also stressed on the increasing number of dams being built and planned in Tibet. As of now in Tibet, around 160 dams are in planning stage and many are already built. He added that China’s destructive policies towards Tibet’s ecosystem are going to affect not only Tibet but all the ten down steam nations including China. s.) (Member of Tibetan Parliament in Exile and Co-chair of International Tibet Network) addressed about international campaigns for the protection of Tibet’s rivers and the importance of finding a tangible solution to the crisis, mutually by all the downstream nations. She also pointed that even though we are little late in realising the importance of this issue, there is so much we can do individually and institutionally. We also screened 3 documentary films on Tibet’s ecosystem; ‘Melt down in Tibet’ by renowned film maker Michael Buckley, ‘Save Tibet Third Pole’ and ‘Achi Dokmo’ both are productions of the Tibetan Women’s Association. Scientists have referred to the Tibetan Plateau and surrounding mountains as The Third Pole; the area holds the largest ice masses on Earth outside of the polar regions. The Tibetan Plateau contains more than 46,000 glaciers (which cover an area of 105,000 sq.km). Originating from these glaciers are Asia’s largest rivers such as the Yangtze, Yellow River, Mekong, Indus, Ganges and Brahmaputra. Nine downstream nations in Asia depend on these rivers. Including the nations of China and India, over a third of the world’s population depends on these rivers. With this event, we want to request every individual to take the responsibility and be aware of such environmental issues especially Tibet’s ecosystem. Along with Tibet’s political issues, it is very important that we keep ourselves updated regarding Tibet’s environment.